Could C-Section Babies Be at Greater Risk for Obesity? A recent study found a surprising link between C-section birth and obesity risk. 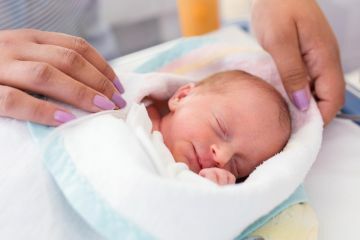 Babies born via Caesarean sections might have a much higher risk of becoming obese later in life, according to a new study from researchers at Johns Hopkins Bloomberg School of Public Health. The study indicated that C-section babies have a 40 percent increase in odds of being obese by age seven as compared to children born vaginally. Researchers observed 1,400 children born at full-term. Their mothers were divided up based on whether they gave birth vaginally or by C-section. Over half the women in each group were obese. Why would there be an association between these two seemingly unrelated factors? According to researchers, it may have everything to do with what C-section babies are not exposed to. During vaginal births, babies pick up microbes from their mothers, and this effect can be incredibly protective. Genetics may be at work here as well: Children born to overweight or obese mothers via C-section had a 70 to 80 percent increased risk for obesity. The jury is definitely still out on whether vaginal seeding—where babies are swabbed with a gauze that was dabbed into the mother's birth canal—should be undertaken. Some doctors are interested in exploring these potential protective benefits, while others are concerned that doing this puts a C-section baby at additional risk for something that's unsubstantiated. And for C-section moms, there's another way to help reduce the risk of obesity—breastfeeding has been shown in numerous studies to reduce the risk of obesity in children, all the way through adulthood. We’ll still need to see more work that can prove a cause-and-effect relationship between the two factors—and it’s important to remember that obese women are at greater risk for C-sections, and that may be a risk factor at work in this association as well. Does all this mean a C-section baby is doomed to become obese? Not at all. No matter what the circumstance, it’s important to implement healthy lifestyle behaviors early on to reduce the risk of obesity.